After learning how difficult it was to apply UV maps, I decided to upload my buildings as is to Google Drive. ShockPuppet and Kralyerg are great modders and modelers and I hope they can take over. Other than some small tweaks, these were done in January. It took me a long time to find them (the copy on my Surface got corrupted) and I should have uploaded the WIP in January. I can provide some of my WIP textures and link to the buildings that inspired my rowhouses. Feel free to do whatever you want with them. Wow thats very generous of you thank you so much! Do as much or as little as you wish. Leave them alone, apply the provided textures with your own UV mapping, apply textures you already used for other buildings, put them in MegaMod, it's all up to you what you do with them. I became extremely proficient at modeling but I never learned to efficiently do UV maps. Judging from the look of those textures, you were making multi material objects. uvw unwrap is best learned in the uvw editor or a single object with a single texture. Something simple like a door. The only way to get better at it is to practice for many hours and read articles on it and watch videos. Takes long time. Theres a new system that I havent tried yet, apparently in newer photoshop you can import 3d models and paint directly on them. At the end it will then make a uv map on the 3d and provide a single texture. I think this is the future and much easier. google drive ds not open for me. i would like to see the clock tower finished thou not as large as a mega skyscraper in the above pic.my concern is what will the banis use to power it??? kinda big to wind up and we havent invented electricity yet. but a big ben monument of sorts would b a nice addition. IDK, gears and trade horses? It could be built out of like 100 building supplies, 5 gears, and 2 trade horses for all I care. It should function like a church with a huge happy radius. The narrow houses are what I want to see most. I could upload the .3ds file too, if that makes it easier. I can also make them all single-material. Yup, its a slight learning curve but Ive been playing around with it and clearly cool. Will be sweet in a productive way! Uses a default 2048 "artboard" as opposed to 1024, but its available. Works seamlessly with Lightwave, so far, as long as no UV's are pre-assigned. And a bit slow to screen render in Photoshop workspace. Haven't done anything super complex yet. It did not enjoy the Apiary... Perhaps just my graphics card and limited RAM in laptop. The yellow rowhouses of Tiers 3 and 4 (4th tier having merely one more storey than 3rd tier and using a paler yellow) are based off real rowhouses in Bath, England. Each tier modernizes a bit, with Tier 1 fitting in the late 17th century and Tier 6 fitting in the late 19th century. Here is the .3ds file without the clocktowers and without textures. The attached image depicts the content of this latest file. I suggest making Tier 0 shorter but I couldn't find a height I liked. Over the past year, I made snippets of textures (putting them on as materials). I provide the best ones I made. BTW, is there any other way for me to help expedite the creation of these narrow houses into MegaMod? I can provide my icons. 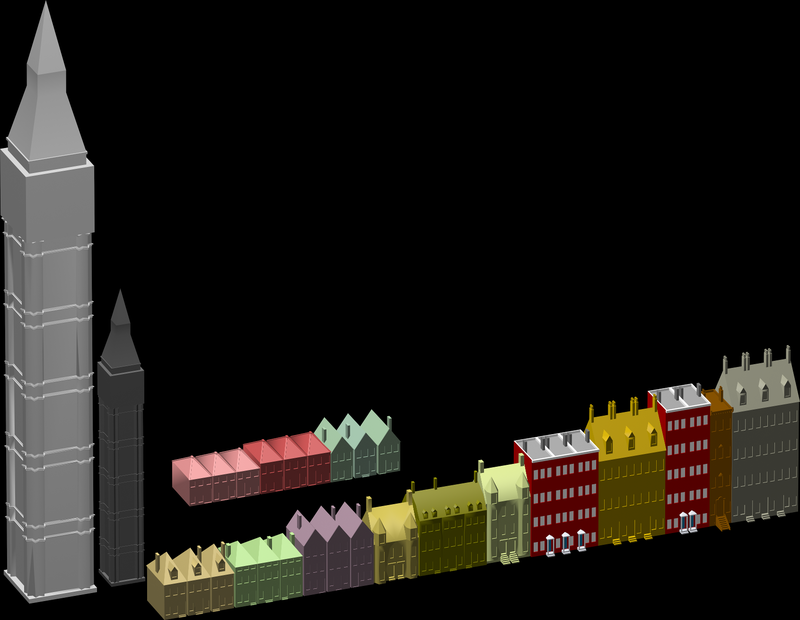 Now that I know the scale is approximately 1.75 meters, I will remake the rowhouses to have only 2 columns of windows. This will reduce the total model count down to 14. My revised rowhouses are finished. Now to make The Pilgrim's houses! I'm donating $20 to BlackLiquid tonight. The Pilgrim will donate $50 for making his houses into a mod and I will donate $30 for making my houses into a mod. The two sets could be put in the same mod or separate ones. Update: I donated Monday because I had to wait until I could confirm my bank with PayPal. @AzemOcram so I gotta hold of your models, and am going to give texturing them a go. I don't know how many I will be able to do, but at least it will get things going for you. Is this the sort of thing you are going for? Let me know what you like/don't like, and any preferred textures. I figured to start of with wood for these smaller ones then progress up to brick based on your build requirements above. These look great! They should have stone chimneys and might look better with a layer of stone around the base but that's up to you. However, I was planning on using wax paper windows for tier 0 and diamond paned windows on tier 1. Grand OK, well the windows will be easy to change now that the UV is organised and set. Just a case of editing the png in photoshop or gimp. I can try to give them a bit of a stone foundation, but I've never tried doing this purely via texture so we'll see how it goes. The UV's don't always scale correctly for some reason, so it is a lot of trial and error to get textures to line up well. Oh and I have absolutely no idea what wax paper windows are... have any images to show me? Also for the diamond ones... I always have trouble finding window textures for some reason. How about this? Should the stone foundation be larger? The stone foundation looks perfect! I meant to say greased paper windows, which can easily be textured by giving the windows a brown tint, preferably with a dark wood trim. If you have any specific preferences/ideas of what each building will look like, such as brick/stone type, color, trim color, door color etc., please make a few notes of it and it will give me a bit of direction... I'm kinda winging it at the moment! The textures are pretty easy to switch out so it is no problem to change things.